The Thirty Years' War was a war fought primarily in Central Europe between 1618 and 1648. One of the most destructive conflicts in human history, it resulted in eight million fatalities not only from military engagements but also from violence, famine, and plague. Casualties were overwhelmingly and disproportionately inhabitants of the Holy Roman Empire, most of the rest being battle deaths from various foreign armies. In terms of proportional German casualties and destruction, it was surpassed only by the period January to May 1945; one of its enduring results was 19th-century Pan-Germanism, when it served as an example of the dangers of a divided Germany and became a key justification for the 1871 creation of the German Empire. Initially a war between various Protestant and Catholic states in the fragmented Holy Roman Empire, it gradually developed into a more general conflict involving most of the European great powers. These states employed relatively large mercenary armies, and the war became less about religion and more of a continuation of the France–Habsburg rivalry for European political pre-eminence. The war was preceded by the election of the new Holy Roman Emperor, Ferdinand II, who tried to impose religious uniformity on his domains, forcing Roman Catholicism on its peoples. The northern Protestant states, angered by the violation of their rights to choose, which had been granted in the Peace of Augsburg, banded together to form the Protestant Union. Ferdinand II was a devout Roman Catholic and much less tolerant than his predecessor, Rudolf II, who ruled from the largely Protestant city of Prague. Ferdinand's policies were considered strongly pro-Catholic and anti-Protestant. These events caused widespread fears throughout northern and central Europe, and triggered the Protestant Bohemians living in the then relatively loose dominion of Habsburg Austria (and also with the Holy Roman Empire) to revolt against their nominal ruler, Ferdinand II. After the so-called Defenestration of Prague deposed the Emperor's representatives in Prague, the Protestant estates and Catholic Habsburgs started gathering allies for war. The Protestant Bohemians ousted the Habsburgs and elected the Calvinist Frederick V, Elector of the Rhenish Palatinate as the new king of the Kingdom of Bohemia. Frederick took the offer without the support of the Protestant Union. The southern states, mainly Roman Catholic, were angered by this. Led by Bavaria, these states formed the Catholic League to expel Frederick in support of the Emperor. The Empire soon crushed the perceived Protestant rebellion in the Battle of White Mountain, executing leading Bohemian aristocrats shortly after. Protestant rulers across Europe unanimously condemned the Emperor's action. After the atrocities committed in Bohemia, Saxony finally gave its support to the Protestant Union and decided to fight back. Sweden, at the time a rising military power, soon intervened in 1630 under its king Gustavus Adolphus, transforming what had been simply the Emperor's attempt to curb the Protestant states into a full-scale war in Europe. Habsburg Spain, wishing to finally crush the Dutch rebels in the Netherlands and the Dutch Republic (which was still a part of the Holy Roman Empire), intervened under the pretext of helping its dynastic Habsburg ally, Austria. No longer able to tolerate the encirclement of two major Habsburg powers on its borders, Catholic France entered the coalition on the side of the Protestants in order to counter the Habsburgs. The Thirty Years' War devastated entire regions, resulting in high mortality, especially among the populations of the German and Italian states, the Crown of Bohemia, and the Southern Netherlands. Both mercenaries and soldiers in fighting armies traditionally looted or extorted tribute to get operating funds, which imposed severe hardships on the inhabitants of occupied territories. The war also bankrupted most of the combatant powers. The Dutch Republic enjoyed contrasting fortune; it was removed from the Holy Roman Empire and was able to end its revolt against Spain in 1648 and subsequently enjoyed a time of great prosperity and development, known as the Dutch Golden Age, during which it became one of the world's foremost economic, colonial, and naval powers. The Thirty Years' War ended with the Treaty of Osnabrück and the Treaties of Münster, part of the wider Peace of Westphalia. The war altered the previous political order of European powers. The rise of Bourbon France, the curtailing of Habsburg ambition, and the ascendancy of Sweden as a great power created a new balance of power on the continent, with France emerging from the war strengthened and increasingly dominant in the latter part of the 17th century. Rulers of the 224 German states could choose the religion (Lutheranism or Catholicism) of their realms. Subjects had to follow that decision or emigrate (the principle of cuius regio, eius religio). Prince-bishoprics and other states ruled by Catholic clergy were excluded and should remain Catholic. Prince-bishops who converted to Lutheranism were required to give up their territories (the principle called reservatum ecclesiasticum). The Holy Roman Empire on the eve of the war's outbreak in 1618. Religious fragmentation in Central Europe on the eve of the war's outbreak in 1618. The Holy Roman Empire was a fragmented collection of largely independent states (a fragmentation that the Peace of Westphalia would solidify). The position of the Holy Roman Emperor was mainly titular, but the emperors, from the House of Habsburg, also directly ruled a large portion of imperial territory (lands of the Archduchy of Austria and the Kingdom of Bohemia), as well as the Kingdom of Hungary. The Austrian domain was thus a major European power in its own right, ruling over some eight million subjects. Another branch of the House of Habsburg ruled over Spain and its empire, which included the Spanish Netherlands, southern Italy, the Philippines, and most of the Americas. 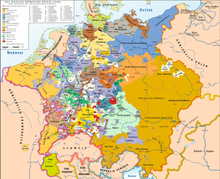 In addition to Habsburg lands, the Holy Roman Empire contained several regional powers, such as the Duchy of Bavaria, the Electorate of Saxony, the Margraviate of Brandenburg, the Electorate of the Palatinate and the Landgraviate of Hesse. A vast number of minor independent duchies, free cities, abbeys, prince-bishoprics, and petty lordships (whose authority sometimes extended to no more than a single village) rounded out the empire. 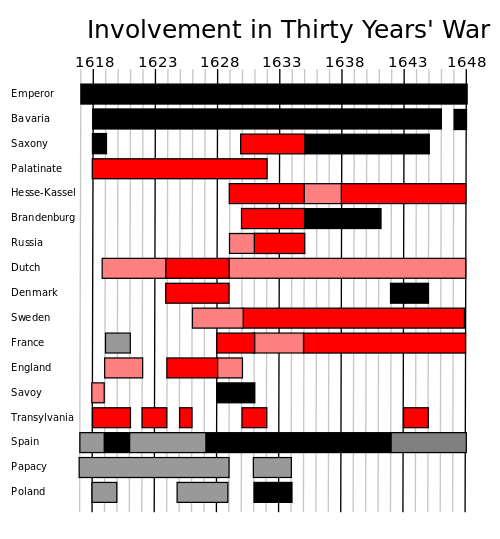 Apart from Austria and perhaps Bavaria, none of those entities was capable of national-level politics; alliances between family-related states were common, due partly to the frequent practice of partible inheritance, i.e. splitting a lord's inheritance among his various sons. Religious tensions remained strong throughout the second half of the 16th century. The Peace of Augsburg began to unravel: some converted bishops refused to give up their bishoprics, and certain Habsburg and other Catholic rulers of the Holy Roman Empire and Spain sought to restore the power of Catholicism in the region. This was evident from the Cologne War (1583–88), a conflict initiated when the prince-archbishop of the city, Gebhard Truchsess von Waldburg, converted to Calvinism. As he was an imperial elector, this could have produced a Protestant majority in the College that elected the Holy Roman Emperor, a position that was always held by a Roman Catholic. Religious tensions broke into violence in the German free city of Donauwörth in 1606. There, the Lutheran majority barred the Catholic residents of the Swabian town from holding an annual Markus procession, which provoked a riot called the 'battle of the flags'. This prompted foreign intervention by Duke Maximilian of Bavaria on behalf of the Catholics. After the violence ceased, Calvinists in Germany (who remained a minority) felt the most threatened. They banded together and formed the Protestant Union in 1608, under the leadership of the Elector Palatine Frederick IV, whose son, Frederick V, married Elizabeth Stuart, the Scottish-born daughter of King James VI of Scotland and I of England and Ireland. The establishment of the league prompted the Catholics into banding together to form the Catholic League in 1609, under the leadership of Duke Maximilian. Tensions escalated further in 1609, with the War of the Jülich Succession, which began when John William, Duke of Jülich-Cleves-Berg, the ruler of the strategically important United Duchies of Jülich-Cleves-Berg, died childless. Two rival claimants vied for the duchy. The first was Duchess Anna of Prussia, daughter of Duke John William's eldest sister, Marie Eleonore of Cleves. Anna was married to John Sigismund, Elector of Brandenburg. The second was Wolfgang William, Count Palatine of Neuburg, who was the son of Duke John William's second-eldest sister, Anna of Cleves. Duchess Anna of Prussia claimed Jülich-Cleves-Berg as the heir to the senior line, while Wolfgang William, Count Palatine of Neuburg, claimed Jülich-Cleves-Berg as Duke John William's eldest male heir. Both claimants were Protestants. In 1610, to prevent war between the rival claimants, the forces of Rudolf II, Holy Roman Emperor occupied Jülich-Cleves-Berg until the Aulic Council (Reichshofrat) resolved the dispute. However, several Protestant princes feared that the emperor Rudolf II, a Catholic, intended to keep Jülich-Cleves-Berg for himself to prevent the United Duchies falling into Protestant hands. Representatives of Henry IV of France and the Dutch Republic gathered forces to invade Jülich-Cleves-Berg, but these plans were cut short by the assassination of Henry IV by the Catholic fanatic François Ravaillac. Hoping to gain an advantage in the dispute, Wolfgang William converted to Catholicism; John Sigismund, though, converted to Calvinism (although Anna of Prussia stayed Lutheran). The dispute was settled in 1614 with the Treaty of Xanten, by which the United Duchies were dismantled: Jülich and Berg were awarded to Wolfgang William, while John Sigismund gained Cleves, Mark, and Ravensberg. The king-elect then sent two Catholic councillors (Vilem Slavata of Chlum and Jaroslav Borzita of Martinice) as his representatives to Prague Castle in Prague in May 1618. Ferdinand had wanted them to administer the government in his absence. On 23 May 1618, an assembly of Protestants seized them and threw them (and also secretary Philip Fabricius) out of the palace window, which was some 21 m (69 ft) off the ground. Although injured, they survived. 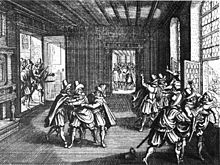 This event, known as the (Second) Defenestration of Prague, started the Bohemian Revolt. Soon afterward, the Bohemian conflict spread through all of the Bohemian Crown, including Bohemia, Silesia, Upper and Lower Lusatia, and Moravia. Moravia was already embroiled in a conflict between Catholics and Protestants. The religious conflict eventually spread across the whole continent of Europe and also increased the concerns of a Habsburg hegemony, involving France, Sweden, and a number of other countries. The death of Emperor Matthias emboldened the rebellious Protestant leaders, who had been on the verge of a settlement. The weaknesses of both Ferdinand (now officially on the throne after the death of Emperor Matthias) and of the Bohemians themselves[clarification needed] led to the spread of the war to western Germany. Ferdinand was compelled to call on his nephew, King Philip IV of Spain, for assistance. The Bohemians, desperate for allies against the emperor, applied to be admitted into the Protestant Union, which was led by their original candidate for the Bohemian throne, the Calvinist Frederick V, Elector Palatine. The Bohemians hinted Frederick would become King of Bohemia if he allowed them to join the Union and come under its protection. However, similar offers were made by other members of the Bohemian Estates to the Duke of Savoy, the Elector of Saxony, and the Prince of Transylvania. The Austrians, who seemed to have intercepted every letter leaving Prague, made these duplicities public. This unraveled much of the support for the Bohemians, particularly in the court of Saxony. In spite of these issues surrounding their support, the rebellion initially favoured the Bohemians. They were joined in the revolt by much of Upper Austria, whose nobility was then chiefly Lutheran and Calvinist. Lower Austria revolted soon after, and in 1619, Count Thurn led an army to the walls of Vienna itself. Moreover, within the British Isles, Frederick V's cause became seen as that of Elizabeth Stuart, described by her supporters as "The Jewell of Europe", leading to a stream of tens of thousands of volunteers to her cause throughout the course of the Thirty Years' War. In the opening phase, an Anglo-Dutch regiment under Horace Vere headed to the Palatinate, a Scots-Dutch regiment under Colonel John Seton moved into Bohemia, and that was joined by a mixed "Regiment of Brittanes" (Scots and English) led by the Scottish Catholic Sir Andrew Gray. Seton's regiment was the last of the Protestant allies to leave the Bohemian theatre after tenaciously holding the town of Třeboň until 1622, and only departing once the rights of the citizens[vague] had been secured. In the east, the Protestant Hungarian Prince of Transylvania, Gabriel Bethlen, led a spirited campaign into Hungary with the support of the Ottoman Sultan, Osman II. Fearful of the Catholic policies of Ferdinand II, Gabriel Bethlen requested a protectorate by Osman II, so "the Ottoman Empire became the one and only ally of great-power status which the rebellious Bohemian states could muster after they had shaken off Habsburg rule and had elected Frederick V as a Protestant king". Ambassadors were exchanged, with Heinrich Bitter visiting Constantinople in January 1620, and Mehmed Aga visiting Prague in July 1620. The Ottomans offered a force of 60,000 cavalry to Frederick and plans were made for an invasion of Poland with 400,000 troops, in exchange for the payment of an annual tribute to the sultan. These negotiations triggered the Polish–Ottoman War of 1620–21. The Ottomans defeated the Poles, who were supporting the Habsburgs in the Thirty Years' War, at the Battle of Cecora in September–October 1620, but were not able to further intervene efficiently before the Bohemian defeat at the Battle of the White Mountain in November 1620. Later, Poles defeated the Ottomans at the Battle of Chocim and the war ended with a status quo. The emperor, who had been preoccupied with the Uskok War, hurried to muster an army to stop the Bohemians and their allies from overwhelming his country. [further explanation needed] Count Bucquoy, the commander of the Imperial army, defeated the forces of the Protestant Union led by Count Mansfeld at the Battle of Sablat, on 10 June 1619. This cut off Count Thurn's communications with Prague, and he was forced to abandon his siege of Vienna. The Battle of Sablat also cost the Protestants an important ally – Savoy, long an opponent of Habsburg expansion. Savoy had already sent considerable sums of money to the Protestants and even troops to garrison fortresses in the Rhineland. The capture of Mansfeld's field chancery revealed the Savoyards' involvement, and they were forced to bow out of the war. The Spanish sent an army from Brussels under Ambrogio Spinola to support the Emperor. In addition, the Spanish ambassador to Vienna, Don Íñigo Vélez de Oñate, persuaded Protestant Saxony to intervene against Bohemia in exchange for control over Lusatia. The Saxons invaded, and the Spanish army in the west prevented the Protestant Union's forces from assisting. Oñate conspired to transfer the electoral title from the Palatinate to the Duke of Bavaria in exchange for his support and that of the Catholic League. The Catholic League's army pacified Upper Austria, while Imperial forces under Johan Tzerclaes, Count of Tilly, pacified Lower Austria. The two armies united and moved north into Bohemia. Ferdinand II decisively defeated Frederick V at the Battle of White Mountain, near Prague, on 8 November 1620. In addition to becoming Catholic, Bohemia remained in Habsburg hands for nearly 300 years. This defeat led to the dissolution of the Protestant Union and the loss of Frederick V's holdings despite the tenacious defence of Trebon, Bohemia (under Colonel Seton) until 1622 and Frankenthal (under Colonel Vere) the following year. Frederick was outlawed from the Holy Roman Empire, and his territories, the Rhenish Palatinate, were given to Catholic nobles. His title of elector of the Palatinate was given to his distant cousin, Duke Maximilian of Bavaria. Frederick, now landless, made himself a prominent exile abroad and tried to curry support for his cause in Sweden, the Netherlands, and Denmark-Norway. The remnants of the Protestant armies, led by Mansfeld and Duke Christian of Brunswick, withdrew into Dutch service. Although their arrival in the Netherlands did help to lift the siege of Bergen-op-Zoom (October 1622), the Dutch could not provide permanent shelter for them. They were paid off and sent to occupy neighboring East Frisia. Mansfeld remained in the Dutch Republic, but Christian wandered off to "assist" his kin in the Lower Saxon Circle, attracting the attentions of Count Tilly. With the news that Mansfeld would not be supporting him, Christian's army began a steady retreat toward the safety of the Dutch border. On 6 August 1623, ten miles short of the border, Tilly's more disciplined army caught up with them. In the ensuing Battle of Stadtlohn, Christian was decisively defeated, losing over four-fifths of his army, which had been some 15,000 strong. After this catastrophe, Frederick V, already in exile in The Hague and under growing pressure from his father-in-law, James I, to end his involvement in the war, was forced to abandon any hope of launching further campaigns. The Protestant rebellion had been crushed. Following the Wars of Religion of 1562–1598, the Protestant Huguenots of France (mainly located in the southwestern provinces) had enjoyed two decades of internal peace under Henry IV, who was originally a Huguenot before converting to Catholicism, and had protected Protestants through the Edict of Nantes. His successor, Louis XIII, under the regency of his Italian Catholic mother, Marie de' Medici, was much less tolerant. The Huguenots responded to increasing persecution by arming themselves, forming independent political and military structures, establishing diplomatic contacts with foreign powers, and finally, openly revolting against the central power. The revolt became an international conflict with the involvement of England in the Anglo-French War (1627–29). The House of Stuart in England had been involved in attempts to secure peace in Europe (through the Spanish Match), and had intervened in the war against both Spain and France. However, defeat by the French (which indirectly led to the assassination of the English leader the Duke of Buckingham), lack of funds for war, and internal conflict between Charles I and his Parliament led to a redirection of English involvement in European affairs – much to the dismay of Protestant forces on the continent. This involved a continued reliance on the Anglo-Dutch brigade as the main agency of English military participation against the Habsburgs, although regiments also fought for Sweden thereafter. France remained the largest Catholic kingdom unaligned with the Habsburg powers, and would later actively wage war against Spain. The French Crown's response to the Huguenot rebellion was not so much a representation of the typical religious polarization of the Thirty Years' War, but rather an attempt at achieving national hegemony by an absolutist monarchy. Peace following the Imperial victory at Stadtlohn (1623) proved short-lived, with conflict resuming at the initiation of Denmark–Norway. Danish involvement, referred to as the Low Saxon War or Kejserkrigen ("the Emperor's War"), began when Christian IV of Denmark, a Lutheran who also ruled as Duke of Holstein, a duchy within the Holy Roman Empire, helped the Lutheran rulers of the neighbouring principalities in what is now Lower Saxony by leading an army against the Imperial forces in 1625. Denmark-Norway had feared that the recent Catholic successes threatened its sovereignty as a Protestant nation. Christian IV had also profited greatly from his policies in northern Germany. For instance, in 1621, Hamburg had been forced to accept Danish sovereignty. Denmark-Norway's King Christian IV had obtained for his kingdom a level of stability and wealth that was virtually unmatched elsewhere in Europe. Denmark-Norway was funded by tolls on the Øresund and also by extensive war reparations from Sweden. Denmark-Norway's cause was aided by France, which together with Charles I, had agreed to help subsidize the war, not the least because Christian was a blood uncle to both the Stuart king and his sister Elizabeth of Bohemia through their mother, Anne of Denmark. Some 13,700 Scottish soldiers were sent as allies to help Christian IV under the command of General Robert Maxwell, 1st Earl of Nithsdale. Moreover, some 6,000 English troops under Charles Morgan also eventually arrived to bolster the defence of Denmark-Norway, though it took longer for these to arrive than Christian hoped, not the least due to the ongoing British campaigns against France and Spain. Thus, Christian, as war-leader of the Lower Saxon Circle, entered the war with an army of only 20,000 mercenaries, some of his allies from England and Scotland and a national army 15,000 strong, leading them as Duke of Holstein rather than as King of Denmark-Norway. Sir Alexander Leslie being made Governour, he resolved for the credit of his Country-men, to make an out-fall upon the Enemy, and desirous to conferre the credit on his own Nation alone, being his first Essay in that Citie. Some in the court of Ferdinand II did not trust Wallenstein, believing he sought to join forces with the German princes and thus gain influence over the Emperor. Ferdinand II dismissed Wallenstein in 1630. He later recalled him, after the Swedes, led by King Gustavus Adolphus, had successfully invaded the Holy Roman Empire and turned the tables on the Catholics. Like Christian IV before him, Gustavus Adolphus came to aid the German Lutherans, to forestall Catholic suzerainty in his back yard, and to obtain economic influence in the German states around the Baltic Sea. He was also concerned about the growing power of the Habsburg monarchy, and like Christian IV before him, was heavily subsidized by Cardinal Richelieu, the chief minister of Louis XIII of France, and by the Dutch. From 1630 to 1634, Swedish-led armies drove the Catholic forces back, regaining much of the lost Protestant territory. During his campaign, he managed to conquer half of the imperial kingdoms, making Sweden the leader of Protestantism in continental Europe until the Swedish Empire ended in 1721. Swedish forces entered the Holy Roman Empire via the Duchy of Pomerania, which served as the Swedish bridgehead since the Treaty of Stettin (1630). After dismissing Wallenstein in 1630, Ferdinand II became dependent on the Catholic League. Gustavus Adolphus allied with France in the Treaty of Bärwalde (January 1631). France and Bavaria signed the secret Treaty of Fontainebleau (1631), but this was rendered irrelevant by Swedish attacks against Bavaria. At the Battle of Breitenfeld (1631), Gustavus Adolphus's forces defeated the Catholic League led by Tilly. A year later, they met again in another Protestant victory, this time accompanied by the death of Tilly. The upper hand had now switched from the Catholic side to the Protestant side, led by Sweden. In 1630, Sweden had paid at least 2,368,022 daler for its army of 42,000 men. In 1632, it contributed only one-fifth of that (476,439 daler) towards the cost of an army more than three times as large (149,000 men). This was possible due to subsidies from France, and the recruitment of prisoners (most of them taken at the Battle of Breitenfeld) into the Swedish army. With Tilly dead, Ferdinand II returned to the aid of Wallenstein and his large army. Wallenstein marched up to the south, threatening Gustavus Adolphus's supply chain. Gustavus Adolphus knew that Wallenstein was waiting for the attack and was prepared but found no other option. Wallenstein and Gustavus Adolphus clashed in the Battle of Lützen (1632), where the Swedes prevailed, but Gustavus Adolphus was killed. The treaty also provided for the union of the army of the emperor and the armies of the German states into a single army of the Holy Roman Empire (although John George I of Saxony and Maximillian I of Bavaria kept, as a practical matter, independent command of their own forces, now nominally components of the "imperial" army). Finally, German princes were forbidden from establishing alliances amongst themselves or with foreign powers, and amnesty was granted to any ruler who had taken up arms against the emperor after the arrival of the Swedes in 1630. This treaty failed to satisfy France, however, because of the renewed strength it granted the Habsburgs. France then entered the conflict, beginning the final period of the Thirty Years' War. Sweden did not take part in the Peace of Prague and it continued the war together with France. Initially after the Peace of Prague, the Swedish armies were pushed back by the reinforced Imperial army north into Germany. France, although mostly Roman Catholic, was a rival of the Holy Roman Empire and Spain. Cardinal Richelieu, the chief minister of King Louis XIII of France, considered the Habsburgs too powerful, since they held a number of territories on France's eastern border, including portions of the Low Countries. Richelieu had already begun intervening indirectly in the war in January 1631, when the French diplomat Hercule de Charnacé signed the Treaty of Bärwalde with Gustavus Adolphus, by which France agreed to support the Swedes with 1,000,000 livres each year in return for a Swedish promise to maintain an army in Germany against the Habsburgs. The treaty also stipulated that Sweden would not conclude a peace with the Holy Roman Emperor without first receiving France's approval. After the Swedish rout at Nördlingen in September 1634 and the Peace of Prague in 1635, in which the Protestant German princes sued for peace with the Emperor, Sweden's ability to continue the war alone appeared doubtful, and Richelieu made the decision to enter into direct war against the Habsburgs. France declared war on Spain in May 1635 and the Holy Roman Empire in August 1636, opening offensives against the Habsburgs in Germany and the Low Countries. France aligned her strategy with the allied Swedes in Wismar (1636) and Hamburg (1638). In 1640 the war reached a climax and the tide turned clearly in favor of the French and against Spain, starting with the siege and capture of the fort at Arras. [note 11] The French conquered Arras from the Spanish following a siege that lasted from 16 June to 9 August 1640. When Arras fell, the way was opened to the French to take all of Flanders. The ensuing French campaign against the Spanish forces in Flanders culminated with a decisive French victory at the battle of Rocroi in May 1643. Louis XIII died in 1643, leaving his five-year-old son Louis XIV on the throne. Mere days later, French General Louis II de Bourbon, 4th Prince de Condé, Duc d'Enghien, The Great Condé, defeated the Spanish army at the Battle of Rocroi in 1643. The same year, however, the French were defeated by the Imperial and Catholic League forces at the battle of Tuttlingen. The chief minister of Louis XIII, Cardinal Mazarin, facing the domestic crisis of the Fronde in 1645, began working to end the war. In 1645, a French army under Turenne was almost destroyed by the Bavarians at the Battle of Herbsthausen. However, reinforced by Louis II de Bourbon, Prince de Condé, it defeated its opponent in the Second Battle of Nördlingen. The last Catholic commander of note, Baron Franz von Mercy, died in the battle. However, the French army's effort on the Rhine had little result, in contrast to its string of victories in Flanders and Artois. The same year, the Swedes entered Austria and besieged Vienna, but they could not take the city and had to retreat. The siege of Brünn in Bohemia proved fruitless, as the Swedish army met with fierce resistance from the Habsburg forces. After five months, the Swedish army, severely worn out, had to withdraw. On 14 March 1647, Bavaria, Cologne, France, and Sweden signed the Truce of Ulm. In 1648, the Swedes (commanded by Marshal Carl Gustaf Wrangel) and the French (led by Turenne) defeated the Imperial army at the Battle of Zusmarshausen, and Condé defeated the Spanish at Lens. However, an Imperial army led by Octavio Piccolomini managed to check the Franco-Swedish army in Bavaria, though their position remained fragile. The Battle of Prague in 1648 became the last action of the Thirty Years' War. The general Hans Christoff von Königsmarck, commanding Sweden's flying column, entered the city and captured Prague Castle (where the event that triggered the war – the Defenestration of Prague – took place, 30 years before). There, they captured many valuable treasures, including the Codex Gigas, which is still today preserved in Stockholm. However, they failed to conquer the right-bank part of Prague and the old city, which resisted until the end of the war. These results left only the Imperial territories of Austria safely in Habsburg hands. News of the French victories in Flanders in 1640 provided strong encouragement to separatist movements against Habsburg Spain in the territories of Catalonia and Portugal. It had been the conscious goal of Cardinal Richelieu to promote a "war by diversion" against the Spanish enhancing difficulties at home that might encourage them to withdraw from the war. 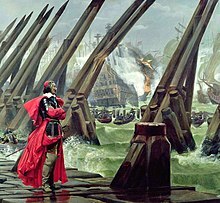 To fight this war by diversion, Cardinal Richelieu had been supplying aid to the Catalans and Portuguese. The Reapers' War Catalan revolt had sprung up spontaneously in May 1640. The threat of having an anti-Habsburg territory establishing a powerful base south of the Pyrenees caused an immediate reaction from the monarchy. The Habsburg government sent a large army of 26,000 men to crush the Catalan revolt. On its way to Barcelona, the Spanish army retook several cities, executing hundreds of prisoners, and a rebel army of the recently-proclaimed Catalan Republic was defeated in Martorell, near Barcelona, on January, 23. In response, the rebels reinforced their efforts and the Catalan Generalitat obtained an important military victory over the Spanish army in the Battle of Montjuïc (January 26, 1641) which dominated the city of Barcelona. Perpinyà (Perpignan) was taken from the Spanish after a siege of 10 months, and the whole of Roussillon fell under direct French control. The Catalan ruling powers half-heartedly accepted the proclamation of Louis XIII of France as sovereign count of Barcelona, as Lluís I of Catalonia For the next decade the Catalans fought under French vassalage, taking the initiative after Montjuïc. Meanwhile, increasing French control of political and administrative affairs, in particular in Northern Catalonia, and a firm military focus on the neighbouring Spanish kingdoms of Valencia and Aragon, in line with Richelieu's war against Spain, gradually undermined Catalan enthusiasm for the French. In parallel, in December 1640, the Portuguese rose up against Spanish rule and once again Richelieu supplied aid to the insurgents.. The ensuing conflict with Spain brought Portugal into the Thirty Years' War as, at least, a peripheral player. From 1641 to 1668, the period during which the two nations were at war, Spain sought to isolate Portugal militarily and diplomatically, and Portugal tried to find the resources to maintain its independence through political alliances and maintenance of its colonial income. The war by diversion in the Iberian Peninsula had its intended effect. Philip IV of Spain was reluctantly forced to divert his attention from the war in northern Europe to deal with his problems at home. Indeed, even at this time, some of Philip's advisers, including the Count of Oñate, were recommending that Philip withdraw from overseas commitments. With Trier, Alsace, and Lorraine all in French hands and the Dutch in charge of Limburg, the Channel and the North Sea, the "Spanish Road" connecting Habsburg Spain with the Habsburg possessions in the Netherlands and Austria was severed. Philip IV could no longer physically send reinforcements to the Low Countries. On 4 December 1642, Cardinal Richelieu died. However, his policy of war by diversion continued to pay dividends to France. Spain was unable to resist the continuing drumbeat of French victories—Gravelines was lost to the French in 1644, followed by Hulst in 1645 and Dunkirk in 1646. The Thirty Years' War would continue until 1648 when the Peace of Westphalia was signed. The conflict between France and Spain continued in Catalonia until 1659, with the confrontation between two sovereigns and two Catalan governments, one based in Barcelona, under the control of Spain and the other in Perpinyà, under the occupation of France. In 1652 the French authorities renounced to Catalonia's territories south of the Pyrenees, but held control of Roussillon, thereby leading to the signing of the Treaty of the Pyrenees in 1659, which finally ended the war between France and Spain, with the partition of restive Catalonia between both empires. The Portuguese Restoration War ended with the Treaty of Lisbon in 1668, that terminated the 60-year Iberian Union. The war ranks with the worst famines and plagues as the greatest medical catastrophe in modern European history. Lacking good census information, historians have extrapolated the experience of well-studied regions. John Theibault agrees with the conclusions in Günther Franz's Der Dreissigjährige Krieg und das Deutsche Volk (1940), that population losses were great but varied regionally (ranging as high as 50%) and says his estimates are the best available. The war killed soldiers and civilians directly, caused famines, destroyed livelihoods, disrupted commerce, postponed marriages and childbirth, and forced large numbers of people to relocate. The overall reduction of population in the German states was typically 25% to 40%. Some regions were affected much more than others. For example, Württemberg lost three-quarters of its population during the war. In the region of Brandenburg, the losses had amounted to half, while in some areas, an estimated two-thirds of the population died. Overall, the male population of the German states was reduced by almost half. The population of the Czech lands declined by a third due to war, disease, famine, and the expulsion of Protestant population. Much of the destruction of civilian lives and property was caused by the cruelty and greed of mercenary soldiers. Villages were especially easy prey to the marauding armies. Those that survived, like the small village of Drais near Mainz, would take almost a hundred years to recover. The Swedish armies alone may have destroyed up to 2,000 castles, 18,000 villages, and 1,500 towns in Germany, one-third of all German towns. A peasant begs for mercy in front of a burning farm. Among the other great social traumas abetted by the war was a major outbreak of witch hunting. This violent wave of inquisitions first erupted in the territories of Franconia during the time of the Danish intervention and the hardship and turmoil the conflict had produced among the general population enabled the hysteria to spread quickly to other parts of Germany. Residents of areas that had been devastated not only by the conflict but also by the numerous crop failures, famines, and epidemics that accompanied it were quick to attribute these calamities to supernatural causes. In this tumultuous and highly volatile environment allegations of witchcraft against neighbors and fellow citizens flourished. The sheer volume of trials and executions during this time would mark the period as the peak of the European witch-hunting phenomenon. The persecutions began in the Bishopric of Würzburg, then under the leadership of Prince-Bishop Philipp Adolf von Ehrenberg. An ardent devotee of the Counter-Reformation, Ehrenberg was eager to consolidate Catholic political authority in the territories he administered. Beginning in 1626 Ehrenberg staged numerous mass trials for witchcraft in which all levels of society (including the nobility and the clergy) found themselves targeted in a relentless series of purges. By 1630, 219 men, women, and children had been burned at the stake in the city of Würzburg itself, while an estimated 900 people are believed to have been put to death in the rural areas of the province. Concurrent with the events in Würzburg, Prince-Bishop Johann von Dornheim would embark upon a similar series of large-scale witch trials in the nearby territory of Bamberg. 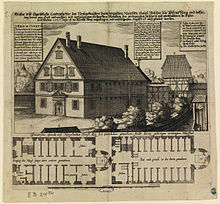 A specially designed Malefizhaus (‘crime house’) was erected containing a torture chamber, whose walls were adorned with Bible verses, in which to interrogate the accused. The Bamberg witch trials would drag on for five years and claimed upwards of 1000 lives, among them Dorothea Flock and the city's long-time Bürgermeister (mayor) Johannes Junius. Meanwhile, 274 suspected witches were put to the torch in the Bishopric of Eichstätt in 1629, while another 50 perished in the adjacent Duchy of Palatinate-Neuburg that same year. Elsewhere, the persecutions arrived in the wake of the early Imperial military successes. The witch hunts expanded into Baden following its reconquest by Tilly while the Imperial victory in the Palatinate opened the way for their eventual spread to the Rhineland. The Rhenish electorates of Mainz and Trier both witnessed mass burnings of suspected witches during this time. In Cologne the territory's Prince-Elector, Ferdinand of Bavaria, presided over a particularly infamous series of witchcraft trials that included the controversial prosecution of Katharina Henot, who was burned at the stake in 1627. During this time the witch hunts also continued their unchecked growth, as new and increased incidents of alleged witchcraft began surfacing in the territories of Westphalia. The witch hunts reached their peak around the time of the Edict of Restitution in 1629 and much of the remaining institutional and popular enthusiasm for them faded in the aftermath of Sweden's entry into the war the following year. However, in Würzburg, the persecutions continued until the death of Ehrenberg in July, 1631. The excesses of this period inspired the Jesuit scholar and poet Friedrich Spee (himself a former "witch confessor") to author his scathing legal and moral condemnation of the witch trials, the Cautio Criminalis. 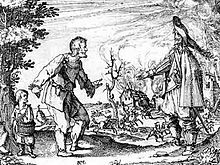 This influential work later was credited with bringing an end to the practice of witch-burning in some areas of Germany and its gradual abolition throughout Europe. The Thirty Years' War rearranged the European power structure. During the last decade of the conflict Spain showed clear signs of weakening. While Spain was fighting in France, Portugal – which had been under personal union with Spain for 60 years – acclaimed John IV of Braganza as king in 1640, and the House of Braganza became the new dynasty of Portugal. Spain was forced to accept the independence of the Dutch Republic in 1648, ending the Eighty Years' War. Bourbon France challenged Habsburg Spain's supremacy in the Franco-Spanish War (1635–59), gaining definitive ascendancy in the War of Devolution (1667–68) and the Franco-Dutch War (1672–78), under the leadership of Louis XIV. The war resulted in the partition of Catalonia between the Spanish and French empires in the Treaty of the Pyrenees. The war resulted in increased autonomy for the constituent states of the Holy Roman Empire, limiting the power of the emperor and decentralizing authority in German-speaking central Europe. For Austria and Bavaria, the result of the war was ambiguous. Bavaria was defeated, devastated, and occupied, but it gained some territory as a result of the treaty in 1648. Austria had utterly failed in reasserting its authority in the empire, but it had successfully suppressed Protestantism in its own dominions. Compared to large parts of Germany, most of its territory was not significantly devastated, and its army was stronger after the war than it was before, unlike that of most other states of the empire. This, along with the shrewd diplomacy of Ferdinand III, allowed it to play an important role in the following decades and to regain some authority among the other German states to face the growing threats of the Ottoman Empire and France. From 1643–1645, during the last years of the war, Sweden and Denmark-Norway fought the Torstenson War. The result of that conflict and the conclusion of the Thirty Years' War helped establish postwar Sweden as a major force in Europe. The arrangements agreed upon in the Peace of Westphalia in 1648 were instrumental in laying the legal foundations of the modern sovereign nation-state. Aside from establishing fixed territorial boundaries for many of the countries involved in the ordeal (as well as for the newer ones created afterwards), the Peace of Westphalia changed the relationship of subjects to their rulers. Previously, many people had borne overlapping, sometimes conflicting political and religious allegiances. Henceforth, the inhabitants of a given state were understood to be subject first and foremost to the laws and edicts of their respective state authority, not to the claims of any other entity, be it religious or secular. This in turn made it easier to levy national armies of significant size, loyal to their state and its leader, so as to reduce the need to employ mercenaries, whose drawbacks had been exposed a century earlier in The Prince. Among the drawbacks were the depravations (such as the Schwedentrunk) and destruction caused by mercenary soldiers, which defied description and resulted in revulsion and hatred of the sponsor of the mercenaries; there would be no other figure such as Albrecht von Wallenstein, and the age of Landsknecht mercenaries would end. The war also had more subtle consequences. It was the last major religious war in mainland Europe, ending the large-scale religious bloodshed accompanying the Reformation, which had begun over a century before. Other religious conflicts occurred until 1712, but only on a minor scale and no great wars. The war also had consequences abroad, as the European powers extended their rivalry via naval power to overseas colonies. In 1630, a Dutch fleet of 70 ships took the rich sugar-exporting areas of Pernambuco (Brazil) from the Portuguese, though the Dutch would lose them by 1654. Fighting also took place in Africa and Asia. Phillip II and III of Portugal used forts built from the destroyed temples, including Fort Fredrick in Trincomalee, and others in southern Ceylon such as Colombo and Galle Fort, to fight sea battles with the Dutch, Danish, French, and English. This was the beginning of the island's loss of sovereignty. Later the Dutch and English succeeded the Portuguese as colonial rulers of the island. Simplicius Simplicissimus (1668) by Hans Jakob Christoffel von Grimmelshausen, one of the most important German novels of the 17th century, is the comic fictional autobiography of a half-German, half-Scottish peasant turned mercenary. He serves under various powers during the war. The book is based on the author's first-hand experience. Memoirs of a Cavalier (1720) by Daniel Defoe is subtitled "A Military Journal of the Wars in Germany, and the Wars in England. From the Years 1632 to 1648". Alessandro Manzoni's The Betrothed (1842) is an historical novel taking place in Italy in 1629. It treats a couple whose marriage is interrupted by the bubonic plague, and other complications of Thirty Years' War. Der Wehrwolf (1910) by Hermann Löns is a novel about an alliance of peasants using guerrilla tactics to fight the enemy during the Thirty Years' War. The Last Valley (1959), by John Pick, is about two men fleeing the Thirty Years' War. Das Treffen in Telgte (1979), by Günter Grass, is set in the aftermath of the war. He implicitly compared conditions to those in postwar Germany in the late 1940s. In The Hangman's Daughter (2008) by Oliver Pötzsch, the protagonist, hangman Jakob Kuisl, and other prominent characters have served in a General Tilly's army and participated in the sacking of the city of Magdeburg during the Thirty Years' War. "The Great War" and Swedish incursion into north-central Germany are frequently referenced. Bertolt Brecht's play Mother Courage and Her Children (1939), an antiwar piece, is set during the Thirty Years' War. Queen Christina (1933), a film starring Greta Garbo, opens with the death of Christina's father, King Gustavus Adolphus, at the Battle of Lützen in the Thirty Years' War. The plot of the film is set against the backdrop of the war and Christina's determination as queen, depicted a decade later, to end the war and bring about peace. The Last Valley (1971) is a film starring Michael Caine and Omar Sharif, who discover a temporary haven from the Thirty Years' War. it was adapted from the novel The Last Valley. Simplicius Simplicissimus (1934-1957) is an opera adaptation of the novel of the same name, with music by Karl Amadeus Hartmann. The Thirty Years' War is briefly referenced in the survival horror game Amnesia: The Dark Descent. The common enemies in the game are former soldiers of the war that abandoned their duty, died and became cursed to roam the woods they died in. ^ a b Reconciled with the Emperor and switched sides in the Peace of Prague (1635). ^ At war with Spain 1625–30 (and France 1627–29): 6000 Englishmen also fought under Charles Morgan in the Danish campaigns. These were largely drawn from the English brigade of four regiments which were based in the Dutch Republic. ^ Scotland declared war and fought against Spain 1625–1630 and France 1627–1629, mostly conducting the war at sea. In addition to providing 2000 troops for the campaign against France in 1627, Scottish privateers harried French shipping and captured and occupied Nova Scotia, Cape Breton, and Quebec. The Scottish Privy Council also provided warrants for 13,700 troops for Danish service who fought under Scottish flag with a Dannerbrog in the top left corner. These were led initially by the Catholic Robert Maxwell, Earl of Nithsdale and more famously by Donald Mackay Lord Reay. In 1630, 8000 more Britons, mostly Scots led by James 3rd Marquis Hamilton landed in Germany under British flag. They were explicitly called the "British army" and had been raised on warrants issued by the English and Scottish Privy councils for allied service alongside Sweden. They joined an estimated 12,000 Scots already in Swedish service commanded by General Sir James Spens, Alexander Leslie, Patrick Ruthven, and John Hepburn. The latter man led a Scottish brigade in France from 1634–1636, after which it fell under the control of the Douglas family. Throughout the entire period of the war, the Scots maintained a brigade of three regiments in Dutch service. The 1625–1638 period represents the period of greatest engagement, though Scots were active as allies in the anti-Habsburg alliance throughout the whole course of the war. ^ Russia supported Sweden against Poland (Smolensk War). ^ Abolished in the Peace of Prague (1635). Its former members continued to support the Holy Roman Emperor. ^ Denmark–Norway fought Sweden and the Dutch Republic in the Torstensson War. ^ Protestantism was effectively wiped out in what is now Austria and the Czech lands by 1648. For comparison of the 1620 and 1648 situation, click: here and here. ^ Protestantism was damaged in Hungary, Slovakia, eastern Silesia, Slovenia, Croatia and Serbia by 1648. For comparison of the 1620 and 1648 situation, click: here and here. ^ This battle is mentioned in Edmond Rostand's play, Cyrano de Bergerac, as the battle in which Rostand's fictional character Cyrano fought. ^ Of the 30,000 citizens, only 5,000 survived. ^ The Consequences and Effects of the Thirty Years War "The later divisions that occurred made Europe more like it is now with the Catholic areas in the south and the Lutherans farther north and more importantly, it took the central power from the Catholic Church." ^ Helmolt, Hans Ferdinand (1903). The World's History: Western Europe to 1800. W. Heinemann. p. 573. ISBN 978-0-217-96566-8. ^ Johnson, Curt. "The French Army of the Thirty Years' War: Introduction and Maison du Roi". Xenophon Group. Early Modern Warfare Society. Retrieved 11 January 2018. ^ Trueman, C. N. "Military developments in the Thirty Years War". Retrieved 16 July 2017. ^ a b c d e Clodfelter, Micheal (2017). Warfare and Armed Conflicts: A Statistical Encyclopedia of Casualty and Other Figures, 1492-2015. McFarland. p. 40. ISBN 978-0786474707. ^ a b "Victimario Histórico Militar". ^ Spain, 1469-1714: A Society of Conflict. Routledge. 2014. p. 193. ^ Wilson, P. (2009). Europe's Tragedy: A History of the Thirty Years War. London: Penguin. p. 4. ISBN 978-0-7139-9592-3. ^ Peter H. Wilson, Europe's Tragedy: A New History of the Thirty Years War (London: Penguin, 2010), 787. ^ Cramer, Kevin (2007). The Thirty Years' War and German Memory in the Nineteenth Century (Studies in War, Society, and the Military). University of Nebraska Press. pp. 18–19. ISBN 978-0-8032-1562-7. ^ "Diets of Speyer (German history) – Britannica Online Encyclopedia". britannica.com. Retrieved 24 May 2008. ^ Geoffrey Parker, The Thirty Years' War (Roultledge Pub. : London, 1997) pp. 17–18. ^ "The Peace of Prague". historylearningsite.co.uk. Retrieved 24 May 2008. ^ "Peace of Prague (1635) – Historic Event — German Archive: The Peace of Prague of 30 May 1635 was a treaty between the Holy Roman Emperor, Ferdinand II, and most of the Protestant states of the Empire. It effectively brought to an end the civil war aspect of the Thirty Years' War (1618–1648); however, the war still carried on due to the continued intervention on German soil of Spain, Sweden, and, from mid-1635, France". germannotes.com. Archived from the original on 20 October 2006. Retrieved 24 May 2008. ^ Joachim., Whaley (2012). Germany and the Holy Roman Empire. Oxford: Oxford University Press. ISBN 978-0199688821. OCLC 772967090. ^ Wilson, Peter. H. (2009). The Thirty Years War: Europe's Tragedy. Belknap Press of Harvard University Press. ^ "Frederick the Winter King. The Columbia Encyclopedia, Sixth Edition. 2001–07". bartleby.com. Archived from the original on 16 May 2008. Retrieved 24 May 2008. ^ a b c d C. V. Wedgwood, The Thirty Years' War (Penguin, 1957, 1961), p. 48. ^ Pierre de l'Estoile, Journal pour le règne de Henri IV, Paris: Gallimard, p 84, 1960. ^ a b C. V. Wedgwood, The Thirty Years' War (Penguin, 1957, 1961), p. 50. ^ Edney, Steve (23 May 2006). "The Defenestration of Prague". Criticality. Retrieved 25 May 2008. ^ a b "Bohemian Revolt". thirtyyearswar.tripod.com. Retrieved 25 May 2008. ^ "Wars of the Western Civilization". visualstatistics.net. Archived from the original on 4 December 2008. Retrieved 24 May 2008. ^ Kellie, Pallas Armata, p. 2a; Monro, His Expedition, vol. 1, p. 37. ^ İnalcık, Halil; Faroqhi, Suraiya; Quataert, Donald; McGowan, Bruce; Pamuk, Sevket (1997). An economic and social history of the Ottoman Empire. Cambridge University Press. pp. 424–425. ISBN 978-0-521-57455-6. ^ Pursell, Brennan C. (2003). The Winter King: Frederick V of the Palatinate and the Coming of the Thirty Years' War. Ashgate. pp. 112–113. ISBN 9780754634010. Retrieved 18 May 2012. ^ Davies, Norman (2005). God's Playground: A History of Poland. Volume I: The Origins to 1795. Oxford University Press. ISBN 978-0-19-925339-5. Retrieved 18 May 2012. ^ Shaw, Ezel Kural. History of the Ottoman Empire and Modern Turkey. p. 191. Archived from the original on 11 January 2014. ^ Halil İnalcık, ed. (1994). An Economic and Social History of the Ottoman Empire. Volume 2: 1600–1914. Cambridge University Press. pp. 424–425. ISBN 978-0-521-57455-6. Retrieved 18 May 2012. ^ Leszek Podhorodecki: Chocim 1621, seria: Historyczne bitwy", MON, 1988. ^ Concerning Mansfeld, one of the greatest military enterprisers in the early years of the war (1618–1626) see Krüssmann, Ernst von Mansfeld, (doctoral thesis, Cologne 2007) Berlin 2010. ^ Lockhart, Paul Douglas (2007). Denmark, 1513–1660: the rise and decline of a Renaissance monarchy. Oxford University Press. p. 166. ISBN 978-0-19-927121-4. Retrieved 7 August 2009. ^ "Danish Kings · Christian 4". danskekonger.dk. Archived from the original on 4 April 2008. Retrieved 24 May 2008. ^ Lockhart, Paul D. (2007). Denmark, 1513–1660: the rise and decline of a Renaissance monarchy. Oxford University Press. ISBN 978-0-19-927121-4. ^ Wilson, Peter (2009). Europe's Tragedy. Penguin. pp. 400–433. ^ "Wallenstein Palace Gardens". prague-guide.co.uk. Archived from the original on 5 April 2008. Retrieved 24 May 2008. ^ "The Danish interval". History.wisc.edu. Archived from the original on 1 January 2012. Retrieved 18 May 2012. ^ "CATHOLIC ENCYCLOPEDIA: Albrecht von Wallenstein". newadvent.org. Retrieved 24 May 2008. ^ Lockhart, Paul Douglas (2007). Denmark, 1513–1660: The Rise and Decline of a Renaissance Monarchy. Oxford University Press. p. 170. ISBN 978-0-19-927121-4. Retrieved 5 August 2009. ^ "The Thirty-Years-War". Archived from the original on 9 October 1999. ^ "Thirty Years War". hyperhistory.com. Retrieved 25 May 2008. ^ "Lecture 6: Europe in the Age of Religious Wars, 1560–1715". historyguide.org. Retrieved 25 May 2008. ^ "Thirty Years' War: Battle of Breitenfeld". historynet.com. 12 June 2006. Retrieved 24 May 2008. ^ "History of the Thirty Years' War". historyworld.net. Retrieved 25 May 2008. ^ Dukes, Paul, ed. (1995). Muscovy and Sweden in the Thirty Years' War 1630–1635. Cambridge University Press. p. [page needed]. ISBN 9780521451390. ^ "Soldater i trettioåriga kriget". Sfhm.se. Retrieved 18 May 2012. ^ Thion, S. French Armies of the Thirty Years' War (Auzielle: Little Round Top Editions, 2008). ^ Murdoch, S.; Zickermann, K.; Marks, A. (2012). "The Battle of Wittstock 1636: Conflicting Reports on a Swedish Victory in Germany". Northern Studies. 43: 71–109. ; Murdoch and Grosjean, pp. 80–85. ^ Geoffrey Parker, The Thirty Years' War (Routledge Press: London, 1984) p. 134. ^ Rhea Marsh Smith, Spain: A Modern History (University of Michigan Press: Ann Arbor, Michigan, 1965), p. 195. ^ a b Rhea Marsh Smith, Spain: A Modern History, p. 195. ^ a b c d e f g Geoffrey Parker, The Thirty Years' War, p. 153; Thion, French Armies, pp. 108, 129. ^ Böhme, Klaus-R (2001). "Die sicherheitspolitische Lage Schwedens nach dem Westfälischen Frieden". In Hacker, Hans-Joachim (ed.). Der Westfälische Frieden von 1648: Wende in der Geschichte des Ostseeraums (in German). Kovač. p. 35. ISBN 978-3-8300-0500-1. ^ "Franz, baron von Mercy – Britannica Online Encyclopedia". britannica.com. Retrieved 22 May 2008. ^ Geoffrey Parker, The Thirty Years' War, p. 137. ^ Geoffrey Parker, The Thirty Years' War (Routledge Press: London, 1984) p. 153. ^ . "Catalonia, Revolt of (1640–1652) - Dictionary definition of Catalonia, Revolt of (1640–1652) | Encyclopedia.com: FREE online dictionary". www.encyclopedia.com. Retrieved 4 November 2017. ^ John A. Lynn, The Wars of Louis XIV (Longman Publishers: Harlow, England, 1999) p. 11. ^ John A. Lynn, The Wars of Louis XIV: 1667–1714., pp. 11–12. ^ Encyclopædia Britannica. "John IV (king of Portugal)". king of Portugal from 1640 as a result of the national revolution, or restoration, which ended 60 years of Spanish rule. ^ Bring, Ove (August 2000). "The Westphalian Peace Tradition in. International Law. From Jus ad Bellum to Jus contra Bellum". International Law Studies. 75: 58. Archived from the original on 22 September 2015. Retrieved 20 April 2017. ^ "Germany History Timeline". countryreports.org. Archived from the original on 29 September 2008. Retrieved 24 May 2008. ^ Parker, Geoffrey (2008). "Crisis and catastrophe: The global crisis of the seventeenth century reconsidered". American Historical Review. 113 (4): 1053–1079. doi:10.1086/ahr.113.4.1053. ^ Outram, Quentin (2002). "The Demographic impact of early modern warfare". Social Science History. 26 (2): 245–272. doi:10.1215/01455532-26-2-245. ^ Outram, Quentin (2001). "The socio-economic relations of warfare and the military mortality crises of the Thirty Years' War". Medical History. 45 (2): 151–184. doi:10.1017/S0025727300067703 (inactive 9 January 2019). PMC 1044352. PMID 11373858. ^ Theibault, John (1997). "The Demography of the Thirty Years War Re-revisited: Günther Franz and his Critics". German History. 15 (1): 1–21. doi:10.1093/gh/15.1.1. ^ "History of Europe – Demographics". Encyclopædia Britannica. ^ "Germany — The Thirty Years' War — The Peace of Westphalia". About.com. Retrieved 24 May 2008. ^ "The Thirty Years' War — Czech republic". czech.cz. Archived from the original on 4 May 2008. Retrieved 24 May 2008. ^ "Historical/Cultural Timeline – 1600s". College of Education, University of Houston. Retrieved 24 May 2008. ^ "The Thirty Year War and its Consequences". Universitätsstadt Tübingen. Archived from the original on 27 March 2008. Retrieved 23 May 2008. ^ "The Thirty Years' War". history-world.org. Retrieved 23 May 2008. ^ Gary F. Jensen (2007). The Path of the Devil: Early Modern Witch Hunts. Rowman & Littlefield. ISBN 9780742546974. Retrieved 5 August 2013. ^ Reilly, Pamela (1959). "Friedrich von Spee's Belief in Witchcraft: Some Deductions from the "Cautio Criminalis"". The Modern Language Review. 54 (1): 51–55. doi:10.2307/3720833. JSTOR 3720833. ^ "Lecture 6: Europe in the Age of Religious Wars, 1560–1715". historyguide.org. Retrieved 27 May 2008. ^ Gnanaprakasar, S. A Critical History of Jaffna, pp. 153–72. ^ "Portuguese Colonial Period (1505 CE–1645 CE)". Rohan Titus. Retrieved 7 December 2007. ^ Grimmelshausen, H. J. Chr. (1669) . Der abentheurliche Simplicissimus [The adventurous Simplicissimus] (in German). Nuremberg: J. Fillion. OCLC 22567416. ^ Pick, J.B. (1959). The Last Valley. Boston: Little, Brown (published 1960). OCLC 1449975. Monro, R. His Expedition with a worthy Scots Regiment called Mac-Keyes, (2 vols., London, 1637) www.exclassics.com/monro/monroint.htm. Åberg, A. (1973). "The Swedish army from Lützen to Narva". In Roberts, M. (ed.). Sweden's Age of Greatness, 1632–1718. London: St. Martin's Press. Benecke, Gerhard (1978). Germany in the Thirty Years War. London: St. Martin's Press. Dukes, Paul, ed. (1995). Muscovy and Sweden in the Thirty Years' War 1630–1635. Cambridge University Press. ISBN 9780521451390. Grosjean, Alexia (2003). An Unofficial Alliance: Scotland and Sweden, 1569–1654. Leiden: Brill. Cramer, Kevin (2007). The Thirty Years' War & German Memory in the Nineteenth Century. Lincoln: University of Nebraska. ISBN 978-0-8032-1562-7. Gindely, Antonín (1884). History of the Thirty Years' War. Putnam. Gutmann, Myron P. (1988). "The Origins of the Thirty Years' War". Journal of Interdisciplinary History. 18 (4): 749–770. doi:10.2307/204823. JSTOR 204823. Kamen, Henry (1968). "The Economic and Social Consequences of the Thirty Years' War". Past and Present. 39 (39): 44–61. doi:10.1093/past/39.1.44. JSTOR 649855. Kennedy, Paul (1988). The Rise and Fall of the Great Powers: Economic Change and Military Conflict from 1500 to 2000. New York: Harper Collins. Langer, Herbert (1980). The Thirty Years' War. Poole, England: Blandford Press. Lynn, John A. (1999). The Wars of Louis XIV: 1667–1714. Harlow, England: Longman. Murdoch, Steve (2001). Scotland and the Thirty Years' War, 1618–1648. Brill. Murdoch, S.; Zickermann, K.; Marks, A. (2012). "The Battle of Wittstock 1636: Conflicting Reports on a Swedish Victory in Germany". Northern Studies. 43: 71–109. Murdoch, Steve; Alexia, Grosjean (2014). Alexander Leslie and the Scottish generals of the Thirty Years' War, 1618–1648. London: Pickering & Chatto. Parker, Geoffrey (1984). The Thirty Years' War. London: Routledge and Kegan Paul. Parrott, D (2001). Richelieu's Army: War, Government and Society in France, 1624–1642. Cambridge University Press. Polišenský, J. V. (1954). "The Thirty Years' War". Past and Present. 6 (6): 31–43. doi:10.1093/past/6.1.31. JSTOR 649813. Polišenský, J. V. (1968). "The Thirty Years' War and the Crises and Revolutions of Seventeenth-Century Europe". Past and Present. 39 (39): 34–43. doi:10.1093/past/39.1.34. JSTOR 649854. Polisensky, Joseph (2001). "A Note on Scottish Soldiers in the Bohemian War, 1619–1622". In Murdoch, Steve (ed.). Scotland and the Thirty Years' war, 1618–1648. Leiden: Brill. pp. 109–115. Prinzing, Friedrich (1916). Epidemics Resulting from Wars. Oxford: Clarendon Press. Rabb, Theodore K (1962). "The Effects of the Thirty Years' War on the German Economy". Journal of Modern History. 34 (1): 40–51. doi:10.1086/238995. JSTOR 1874817. Ringmar, Erik (2008) . Identity, Interest and Action: A Cultural Explanation of the Swedish Intervention in the Thirty Years War. Cambridge University Press. ISBN 978-0521026031. Roberts, Michael (1958). Gustavus Adolphus: A History of Sweden, 1611–1632. Longmans, Green and C°. Thion, S. (2008). French Armies of the Thirty Years' War. Auzielle: Little Round Top Editions. Ward, A. W. (1902). The Cambridge Modern History. Volume 4: The Thirty Years War. Wedgwood, C. V. (2005). Thirty Years War. forward by Anthony Grafton. New York: The New York Review of Books, Inc. ISBN 978-1-59017-146-2. Wilson, Peter H. (2009). Europe's Tragedy: A History of the Thirty Years War. Allen Lane. ISBN 978-0-7139-9592-3. "The 30 Years' War (1618-48) and the Second Defenestration of Prague - Professor Peter Wilson". Gresham College. 24 May 2018. "Thirty Years' War" . Encyclopædia Britannica. 26 (11th ed.). 1911. Spahn, Martin (1912). "The Thirty Years War" . Catholic Encyclopedia. 14.